Bern Identity made waves early in the racing season with a second-place finish at the Delta Downs Jackpot Stakes, finishing behind Derby favorite Goldencents. His next run was the Holy Bull Stakes at Gulfstream Park, and that didn’t go as well. In a talented field that included Itsmyluckday, Shanghai Bobby and Clearly Now, Bern Identity finished a distant fifth and failed to impress a number of onlookers. Bernstein spent the majority of his racing time in Ireland though did come stateside, finishing fifth in his lone U.S. appearance at the 1 1/8-mile River City on turf. Bernstein also spent some time running in South America, where he achieved a modicum of success. Breen originally sought out to be a jockey, but a massive growth spurt during his youth all but ruled it out. The New Jersey-born trainer recorded a number of major racing wins in the latter part of the decade, but gained major notoriety on the racing scene by capturing the 2011 Belmont Stakes thanks to a fantastic run from his horse, Ruler on Ice. As far as history at the Kentucky Derby goes, Breen isn’t a cagey veteran but does have some experience. He’s saddled two horses at Churchill Downs before, with his most notable race being a ninth-place finish with West Side Bernie in 2009. George Hall is best known as the president and founder of Clinton Group, but has owned and trained horses with wife Lori since 2004. The two have been in close contact with Breen ever since, combining for the aforementioned nineth place Derby finish in 2009 with West Side Bernie. As for earners, the Hall’s scored with Pants on Fire in 2011, as he captured the $1 million Louisiana Derby and placed nineth at that year’s Kentucky Derby. 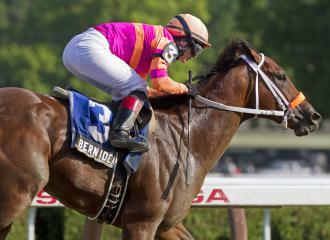 Venezuelan jockey Ramon Dominguez rode Bern Identity at Holy Bull and could be Breen and Hall’s choice moving forward. While they weren’t overly thrilled at the fifth place finish, both trainer and owner were able to see some positives from the race, and vowed to keep positive moving forward. “It was the first time Ramon had ridden the horse, and he might not have been as familiar with him as much as we might have liked. Ramon came back and gave us some real input,” Breen told Brisnet. “He looks to me physically like a sprinter. His mother (Maddalena) was a sprinter.” – Breen, speaking about Bern Identity to the Albany Times-Union.